Today is a very colorful day! I get to talk to you about the general understanding of colors. What are colors, Pantones, and color hexadecimals? Sit back and relax; it’s time to learn! To understand colors, we need to start with the primary colors. Primary colors (red, yellow, and blue) are the building blocks for all other colors. Secondary colors are primary colors mixed with each other. Mixing red and yellow creates orange; yellow and blue make green; blue and red make violet. Combining these colors in projects can make for a lot of contrast. The next set of colors is called tertiary colors. We take the secondary colors and mix them with the primary colors to create red-violet, blue-violet, blue-green, yellow-green, red-orange, and yellow-orange. 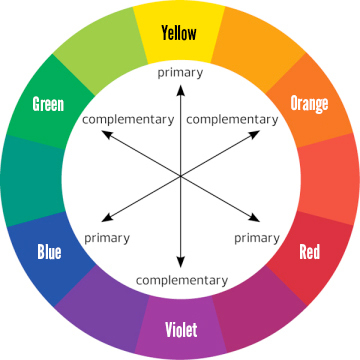 Now that you understand how the color combinations on the color wheel model work, we can choose the best color combinations that work well together. With color, you can set the right mood and create the right amount of contrast within your design work. Picking the wrong colors can make readers feel sick and avoid your media. Red can be used in many different ways. Love and passion are what most people associate with the color. However, red is also associated with anger and blood. This color can be used to command attention, set a serious tone, or to show that something is dangerous. Be careful using red in combinations: red with orange and yellow is normally associated with fire. Red and black should be avoided because of how hard it is for the mind to identify. Orange is less aggressive than red. Orange represents warmth without the risk of the viewer correlating the color with anger. Orange can portray a fun atmosphere, health, wealth, prosperity, and change. Yellow is associated with the sun, warmth, attention-getting, happiness, laughter, hunger, and intensity. When used with orange, it creates a sense of summer fun. When combined with black, it can draw a lot of attention. Just look at the color palate of most taxis. Green is the color of money, so in our culture, it is associated with wealth. Nature brings us many colors, green being one of the most common, so we've come to link it with growth and health. It is used to show that products are natural and healthy. Combined with blue, green further perpetuates health, cleanliness, life, and calmness. Violet has been associated with kings, nobles, and magistrates for thousands of years due to its cost. Tyrian purple was made from thousands of tiny snails, and the dye was worth its weight in silver, so only the very wealthy could buy it. Purples with more red can be associated with romance, intimacy, softness, and comfort. Purple can also instill a sense of mystique, luxury, spirituality, and wisdom. White can represent cleanliness, softness (cotton/clouds), sterility (doctors/hospitals), and purity. Its association with purity can make it seem virtuous, but also sterile and cold. White pairs well with just about anything, making it ideal as a secondary color. Black is tricky because of its wide range of associations: death, decay, intelligence, and authority. Black can represent evil because it is the opposite of white, which traditionally represents good. It can represent anxiety, depression, loneliness, and despair, because of the association with darkness and the unknown. However, despite all of its negative associations, when combined with other colors, it can send an entirely different message. For example, black and gold can represent luxury. Combined with silver or grey, it can represent sophistication. Black is also a good way to show power. Never use pure black (#000000). 100% black is often too overpowering and can make the viewer feel sick. Holiday color combinations to avoid: orange & black, red, white, & blue, spring & Easter pastels, pink & red, red & green, black, red & green, and blue & white. This is an example of bad colors. Color vibration occurs when the edges of two different, strong colors of similar intensity compete for your attention. Don’t only use primary colors or secondary colors. These colors are hard on the eyes because they are on opposite ends of the wheel. Light colors on light colors and dark colors on dark colors are also a big no-no. When picking the right color combination, pick one or two colors you want to use, and then find different hues of them. Or find colors that complement each other. Pantone LLC, headquartered in New Jersey, is best known for its Pantone Matching System. They created a color space that is used in a variety of industries throughout the manufacturing of colored prints, paints, fabrics, and plastics. Pantone Color has set the standards for color. Because of this, Pantone created a color guide that is used by artists, designers, printers, manufacturers, marketers, and in numerous industries worldwide for accurate color identification. This helps keep the design specification, quality control, and communication uniform. We wouldn’t want to have to look at multiple color spaces to identify a color. Hexadecimal colors (HEX color) are values of code in a hex triplet, which represents three separate values that specify the levels of the component colors. They are expressed as a six-digit combination of numbers and letters defined by order its mix of red, green, and blue (RGB). It starts with a pound sign (#) and then is followed by six hex values or three hex value pairs, for example, #eb6841 would be 235, 104, 65. White would be #fffffff or 255, 255, 255. The height value limit the hex code can go is 255. This code is supported in all browsers generally associated with HTML and screen media. 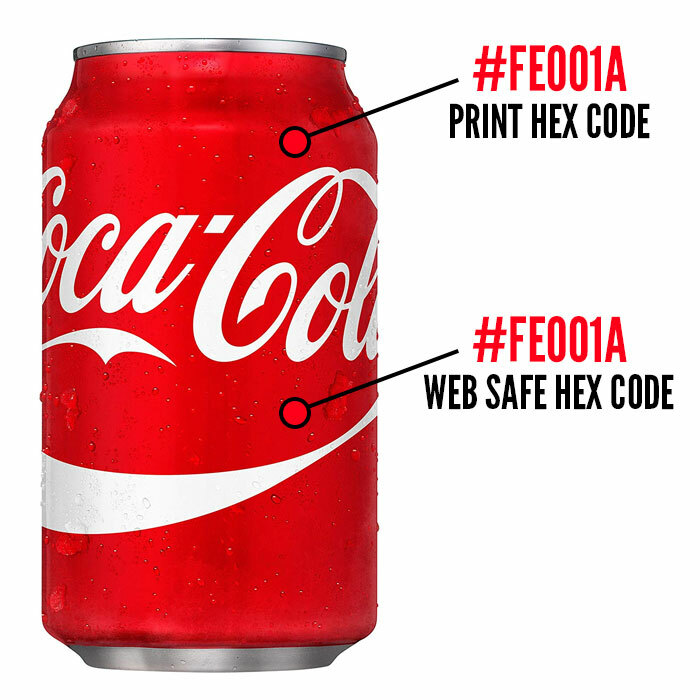 There are many ways you can find color's hex codes. 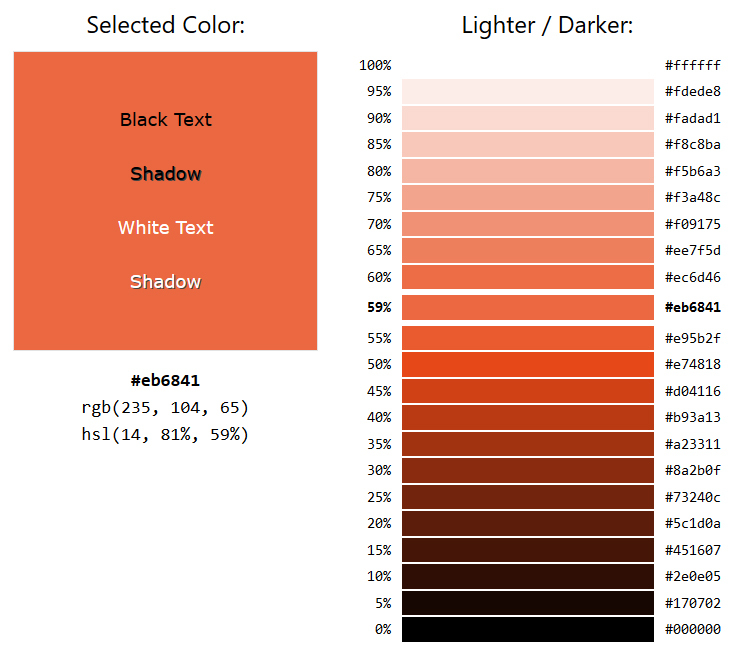 HTML Color Picker is a great way to see the different variations of a single color. There are two basic categories of color types: print and onscreen. For print we use CMYK. The CMYK process is a method of printing color by using four inks: cyan, magenta, yellow, and black. The majority of the world's printed material is produced using the CMYK process, and there is a special subset of Pantone colors that can be reproduced using CMYK. It simply depends on the kind of printer you are using and what material you are printing on. Companies have created their own guidelines within CMYK. Let's look at #eb6841 CMYK 3%, 74%, 81%, 0%. Coca-Cola strives to make their product universally identifiable. No matter where you are in the world, when you see this red & white can, you it's a Coke. Coca-Cola is a great example. Looking at the image, you can see their hex codes. These colors can be used on the web easily but run into trouble when they have to be printed. The red that Coke uses is not an easy color to recreate. They go to a printing manufacturing company that will mix the ink to the color specification of Coke Red. This way their Coke Red is universally the same. Time to Use Colors to Your Advantage! And that is just the surface of colors. Congratulations! You can watch as businesses try to use different color combinations to get your attention. And I've only just begun to scratch the surface of colors. If you like this blog and have any question, please ask. I enjoy bringing the world of art to you. Remember, you have the power to request blog topics. Whether it's about science, coding, security, kittens, or fun facts. Please let us know!